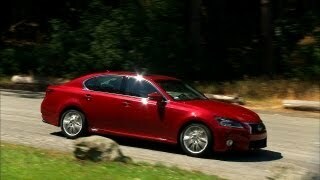 Lexus GS 450h 2013 was unveiled at the Frankfurt Auto Show 2011. Back in 2007, the GS 450h was the first hybrid-powered luxury sport sedan to enter the market and today, the GS 450h is the world’s first premium performance sedan to be equipped with a V6 Atkinson cycle gas engine and two-motor hybrid system, in a front engine rear-wheel drive vehicle. With a total system power output of 338 hp, the GS 450h accelerates effortlessly from 0-60 mph in 5.6 seconds. As with all Lexus hybrid vehicles, the new GS 450h is a full hybrid capable of operating in gas-only or electric-only modes, as well as a combination of both. Its Lexus Hybrid Drive system features an ultra-smooth running, Atkinson cycle 3.5-liter V6 engine mated to a compact, high-output, water-cooled permanent magnet electric motor. The two powerplants drive the rear wheels both independently and in tandem, as needed. 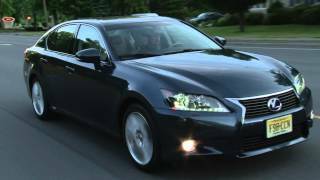 •	New Atkinson Cycle V6 with Gas EngineFRANKFURT – Sept. 12, 2011 - With a five vehicle hybrid line-up, Lexus reinforces its commitment to hybrid technology with the all-new 2013 GS 450h. When it was introduced for the 2007 model year, the GS 450h was the first hybrid-powered luxury sport sedan to enter the market. Today, the GS 450h is the world’s first premium performance sedan to be equipped with a V6 Atkinson cycle gas engine and two-motor hybrid system, in a front engine rear-wheel drive vehicle. 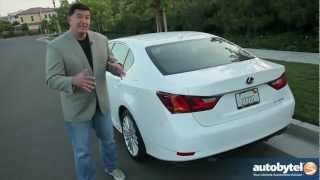 The hybrid version of the 2013 GS 350 incorporates improvements to its hybrid powertrain and is equipped with a second generation Lexus Hybrid Drive system. GS 450h engineers have aimed for reductions in fuel consumption and emissions, while providing exhilarating performance. With a total system power output of 338 hp, the GS 450h will accelerate effortlessly from 0-60 mph in 5.6 seconds. Conversely, fuel consumption is expected to be improved by more than 30 percent. The GS 450h is targeting certification as a Super-Ultra Low Emissions Vehicle II (SULEV II). The new GS hybrid also features a Drive Mode selector. In addition to the Normal mode, the driver can customize the driving experience using Eco, Sport S, Sport S+ and EV modes. As with all Lexus hybrid vehicles, the new GS 450h is a full hybrid capable of operating in gas-only or electric-only modes, as well as a combination of both. Its Lexus Hybrid Drive system features an ultra-smooth running, Atkinson cycle 3.5-liter V6 engine mated to a compact, high-output, water-cooled permanent magnet electric motor. The two powerplants drive the rear wheels both independently and in tandem, as needed. In addition to the gas engine and electric motor, the new GS 450h’s hybrid drive system a generator; a high-performance nickel-metal hydride battery; a power split device which, via planetary reduction gears, combines and re-allocates power from the engine, electric motor and generator according to operational requirements; and a compact power control unit to govern the high speed interaction of the system components. Adapted specifically for the hybrid powertrain and a first for premium performance sedans, the 3.5-liter V6, DOHC engine benefits from several technical improvements including the adoption of the Atkinson Cycle engine design to optimize the fuel-efficient benefits of Lexus Hybrid Drive. Compression is delayed in an Atkinson Cycle engine, because the intake valves close late. This creates a high expansion ratio for less compression, reducing intake and exhaust energy losses and converting combustion energy to engine power more effectively. A high compression ratio of 13:1; a new, mid-port intake tumble generator; and the adoption of the latest evolution of Lexus’ four-stroke, direct injection technology, D-4S, help the GS 450h achieve better fuel consumption. With one injector installed in the combustion chamber and a second mounted in the intake port, D-4S combines the strengths of both direct and port injection, realizing optimum engine efficiency throughout the power band and improving torque across the rev range, while minimizing fuel consumption and emissions. The D-4S system features new slit-type injector nozzles with a modified port shape, a higher fuel pressure for more efficient combustion, and idle port injection for improved NHV characteristics. Engine noise, vibration and friction have been lowered through the adoption of lightweight chain technology. The cooling performance of the hybrid system’s Power Control Unit (PCU) helps reduce fuel consumption and has been improved through the adoption of dual cooling paths and a single-piece, integrated AC/DC converter. System control has been enhanced. The PCU boosts motor drive voltage to a maximum 650V in Sport mode and limits it to a maximum of 500V in Eco mode under normal driving conditions where maximum output is not required. The motor is driven at lower voltage to provide a more environmentally–advanced driving performance to help enhance fuel efficiency. The electric motor features lighter mounts and reduced friction. The system’s regenerative braking operation range has been expanded, contributing to further improvements in fuel efficiency. In addition, the battery layout has been redesigned. A new stacked configuration maximizing luggage space allows the 2013 GS 450h to have more cargo area than the previous generation gas model. All second-generation GS hybrid models have a new platform that is designed to be more rigid compared to the previous models. Engineers conducted extensive platform testing, ultimately increasing the number of spot welds and adding laser welds in very specific locations. The track works in combination with a revised suspension design to assure a more solid stance and superior cornering performance. The new suspension system is designed to help guide the 2013 GS through corners with precision. In the front, upper and lower control arms are made from aluminum and employ larger bushings. The rear subframe has been completely redesigned to accommodate an all-new multi-link rear suspension, using improved suspension geometry that retains tire cornering force and enhances rear control. With the stiffer platform and lighter components, the shocks can use lighter-viscosity oil, so they move easily and respond to small inputs more quickly. The use of front and rear aluminum control arms helps reduce unsprung weight and results in significant improvements in agility, roll damping, ride comfort, body control and steering precision. Overall, the suspension is lighter and stronger, allowing it to react to driver input readily, and ride quietly without harshness. Ventilated disc brakes featuring four-piston aluminum front calipers includes the latest electronic enhancements to help provide braking balance and control. The standard 17-inch alloy wheels are paired with 225/50R17 tires while the optional 18-inch alloy wheels are equipped with 235/45R18 tires. The GS 450h’s Electronically Controlled Braking (ECB) system characteristics have been modified to provide greater responsiveness from the first touch of the pedal. Like the GS 350, the GS 450h will be standard equipped with 10 airbags, including a knee airbag for both driver and front passenger. Rear seat occupants have seat-mounted side airbags, and all four outboard occupants are equipped with side curtain airbags. Also standard are new Whiplash Injury Lessening (WIL) front seats that reduce the space between the occupant’s head and headrest, to help limit excessive head movement, and help decrease the severity of whiplash-type injuries in certain types of collisions. Standard seatbelts with pretensioners with force limiters used for front and outboard rear seats further assist occupant protection. Available options to help further enhance safety include a pre-collision system, which uses the dynamic radar cruise control system to provide early warning of upcoming objects that might result in a collision. The system also uses a Lexus first infrared camera to monitor the driver’s eyes to check on driver status. In the event that the driver does not appear to be looking forward when a collision appears imminent, the system will initiate the warning at an earlier threshold. If the driver still does not respond and make the appropriate maneuver, the system will initiate light braking intervention up to two seconds prior to impact, designed to help to lessen the severity of the collision. Other available safety systems include a Night Vision System that enhances driver visibility at night; Heads Up Display (HUD); a Blind Spot Monitor that helps detect vehicles in rear/side blind spots; and Lane Keep Assist (LKA) with Lane Departure Warning (LDW). LKA provides a small amount of active steering torque to help maintain course, while the LDW feature alerts the driver if the system detects that the vehicle is beginning to drift out of the lane. The 2013 GS expresses a new generation of Lexus’ design philosophy with its precisely sculpted exterior and will lead the rest of the lineup in an entirely new direction. When designers shaped the GS they visualized the flow of air around it and, like the LFA supercar, maximized aerodynamic efficiency. Exclusive to the hybrid model is a unique three-lamp design that aligns the turn signal and Lexus-first high and low beam LED lamps in a single horizontal row. The improved illumination and beam range provided by LED lamps offers better visibility even under low beam driving conditions. In addition, the rear bumper of the GS 450h covers the exhaust pipe apertures. 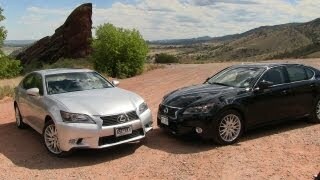 The GS 450h can also be distinguished by Lexus’ signature blue hybrid badging. The GS fuses distinctive style with engineering functionality. Fins incorporated into the side of the tail lamps and the design of the trunk area all help direct air over and past the car. The rear bumper underbody area was designed for reduced wind resistance to help keep the car steady. Finally, air inlets located on the outer edges of the lower grille serve as cooling ducts. The signature spindle grille with its trapezoidal contours evolved from current Lexus styling and fully integrates into the aggressive front bumper allowing for efficient airflow. This distinctive Lexus design feature combined with the deep-set, high-tech headlamps and L-shaped LED daytime running lamps further express the vehicle’s confident and dynamic character. From the side, the GS projects the image of a spacious sport sedan with a road-hugging wider stance. The tapered lower rocker panel and the short front overhang give the vehicle a sense of motion. Width-enhancing front and rear wheel arches adds an athletic stance enhancing the vehicle’s dynamic presence. The rear bumper features centered aero fins to help control underbody airflow. Combined with the L-shaped LED tail lamps, a Lexus design cue, these rear bumper features lend a high-performance appearance. Overall, the new GS sheet metal represents a significant extension of the Lexus L-finesse philosophy that is the core of all Lexus product design. The GS line-up will feature three colors that are new to the Lexus color palette: Riviera Red, Meteor Blue Mica and Liquid Platinum. Vehicles in Riviera Red will benefit from glass flakes incorporated into the coating that adds a high level of brilliance to the paint. Lexus engineers developed a new advanced coating process for Liquid Platinum exteriors. The GS will be the first Lexus to adopt this new coating technology. Vehicles with the Liquid Platinum exterior will appear more radiant as an additional metallic texture gives both strong shading and defined, sharp highlights. This metallic effect makes subtle and defined bodylines more noticeable and the surface appear finely polished. The GS 450h will share the same luxurious and technological amenities as its gas counterpart, including next generation Remote Touch; analog clock with LED indicators, carved from an ingot; and a new energy-saving auto climate control system called S-Flow that focuses airflow only to the front area where passengers are actually seated. A few notable differences include a bamboo-finished steering wheel which reinforces the sustainability of the GS 450h, and the hybrid monitor.